EDINBURG — The contractor for the new courthouse will build a mock courtroom to give key stakeholders the ability to review the design before construction begins, and so far, state district judges do not like the way their courtrooms will flow. Oscar Garcia of Jacobs Project Management met with the Hidalgo County Board of Judges on Thursday to brief them on the project and to find two judges willing to serve on a steering committee that will focus on the “look and feel” of the facility. The project is well underway already, Garcia said. Terracon Consultants Inc. is already testing the soil, the Texas Department of Transportation will be meeting to discuss the closure of a portion of Highway 107, and if all goes according to plan, ground will be broken in the fall. “By the end of this calendar year, your courthouse will be under construction,” Garcia told the judges. But before that happens, Morganti Texas, the construction manager at risk, will build a mock courtroom at a nearby site. The firm expects to build it in June and is currently searching for a location. The courtrooms are currently designed to be about 2,000 square feet, giving judges almost double the space they currently have. But the manner in which people will reach their offices did not sit well with the board of judges. And that’s exactly what the judges did. The judges also had questions about Edinburg’s financial commitment and parking. Garcia said the county will be sitting down with Edinburg officials next week to discuss the issue. “The parking, is it convenient for everybody,” Flores later asked. The question was marked by silence from Garcia. “Yes? No? We don’t know,” Flores asked rhetorically. 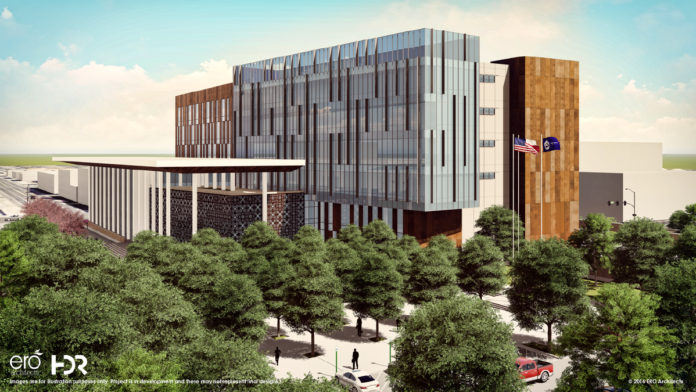 “It’s called a parking garage,” one of the judges said, though that’s not currently part of the official design for the courthouse. The board ultimately appointed state District Judge Letty Lopez and County Court-at-Law No. 5 Judge Arnoldo Cantu to the nine-member steering committee.